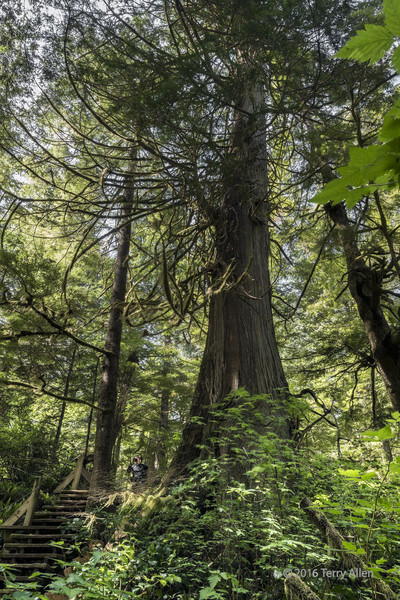 Western red cedar trees on Meares Island, off Tofino, British Columbia. The biggest trees are 1000 years old or more. You have to look close at larger sizes to see him, but his tiny figures gives a sense of scale to the trees! Impressive tree and a super shot! Huge trees! Logan and I are planning a trip to the redwoods close to here. Wow, those trees are amazing. They just fascinate me, and I wish we had more opportunities to see them in person. Yes, viewing in the larger size is wonderful. Scale is just one of the challenges to photographing these giants. Well done with this one. Great to see another area where old growth has been spared. Having the person in the frame certainly does provide scale to appreciate the size of these cedars.